Orlando, FL (July 21, 2016): David Weekley Homes, the nation’s largest privately-held builder, celebrated the grand opening of its newest model home in John’s Lake Landing with more than 150 guests and a ribbon-cutting with Pam Jones, the community relations representative from U.S. Representative Daniel Webster’s office. The Boulevard is the second model home in Johns Lake Landing Manor Series and is situated on a 75-foot homesites. Priced from the $340s, the one-story Boulevard includes four bedrooms, three full baths, one half bath and a three-car garage within 3,100 square feet. Along with touring the newly-opened model home, grand opening attendees enjoyed food and fun for the whole family while listening to classic rock from onsite 1059 Sunny FM. Buyers in Johns Lake Landing can choose from nine floor plans from the Manor Series, situated on 75- or 85-foot homesites. Homeowners in John’s Lake Landing will enjoy a 2,400-acre ski and bass-fishing lake, lakefront and conservation homesites and a future pool with a cabana. For more information about David Weekley Homes in John’s Lake Landing, call 407-865-8283. 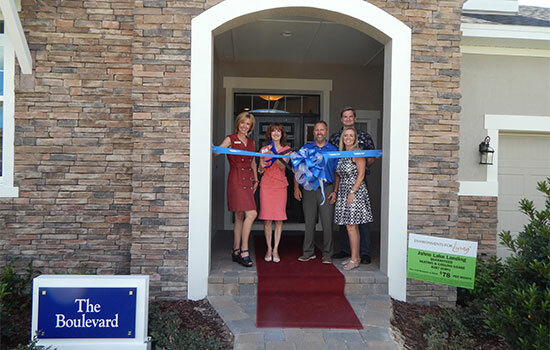 Pam Jones, the community relations representative from U.S. Representative Daniel Webster's office, helped cut the ribbon at the David Weekley Homes grand opening event for its newest home, The Boulevard, in John's Lake Landing.